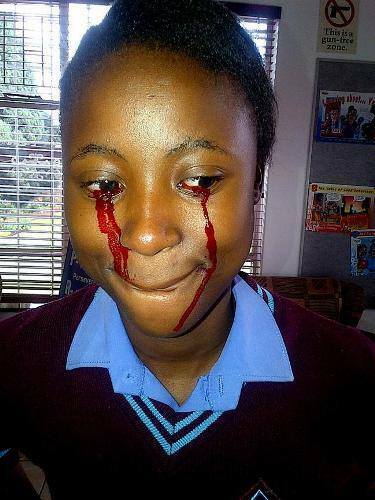 Daily Sun: Jane, the 13-year-old girl, from Katlehong in Ekurhuleni, also bleeds from other places all over her body. Blood comes out of her hands, stomach and legs. It often comes when she is at school and it scares other pupils. Jane Mothibe’s mum, Welheminah (43), has taken Jane to doctors and to their church for help. But nobody could find the cause of the bleeding. “One doctor said I was crazy and laughed at me. He took my R350 and gave me medicine for Jane but said he saw nothing wrong,” said Welheminah. The bleeding didn’t stop and Jane was sent to hospital. Many tests were done but doctors couldn’t find anything wrong with her. The bleeding stopped in June but started again last Friday. “Now it’s on her stomach, ears and thighs. It’s everywhere. Kids at school are even saying that she has blood cancer,” the mum said. Jane said she doesn’t feel any pain from the bleeding. “I don’t feel, and my classmates have to tell me that it’s started again. Mysterious bleeding like Jane’s has been reported for many centuries. Catholic tradition calls it stigmata and it usually affects people who are very religious and close to God. The bleeding is believed to come from wounds that match those Jesus suffered when he was crucified. Catholic priest Father Smangaliso Mkhatshwa told the South African national tabloid that the church will investigate what’s happening to Jane. “It could be a rare disease, but there could also be religious causes,” he said. One of Jane’s schoolmates told the People’s Paper that she loves Jane, but gets scared when the bleeding starts. Welheminah’s colleague, Carol Mofokeng, also tried to help the girl. “I have seen Jane being brought from school with bandages, but without wounds. This is sad. She needs help to understand what is happening to her,” Carol said. This entry was posted in Uncategorized and tagged Africa THisday, Daily sun, South African Girl cries out Blood..
WHY BILL GATES OFFERED YOUNG THUG $9M TO QUIT MUSIC.